Click here for a sample of ANC040/041. The actress wraps a blanket around / the actress’s curled body. / Flood watches the actress and the intertitles. / The story is in the folds. / The actress’s hand pulls the blanket over / the remaining exposed body. A familiar shape, / a black and white S lies on the bed. 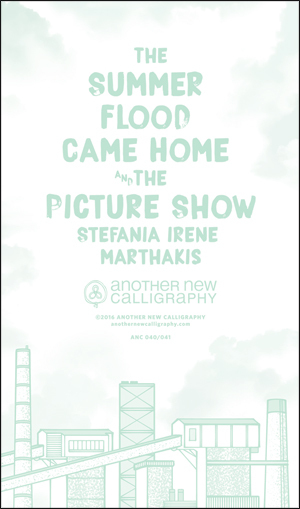 Throughout The Summer Flood Came Home, Stefania Irene Marthakis’ cinematic descriptions invite readers not simply to watch the film as each poem unfolds, but also to take part in the scene. We are given stage directions drawing us further into the landscapes she creates: moments of shock and beauty in the domestic, from the neighborhoods and factories of Indiana. Her narrator acts as the director of a memory-film and we are an audience beyond the fourth wall. Marthakis weaves the complex dynamics of family, lineage, memory and communication, through the bodily experience of everyday objects, blending the deep mythology of a family and its layers of intergenerational trauma into the figure of a child. The lens of Flood – an esoteric figure of a youth defined by interaction and exchange with specters real and imagined, fluid at different times in terms of flesh/age/gender/memory – a middle child, in terms of time, space, and dimension – a medium. As such, memories rush as in a flood beating against the walls of the narrative itself, contained by the structure of the prose poem, as a family's passions are constrained by, and at times rage against, the walls of a house. A mesmerizing exploration of a life sans speech, yet rich with word. Cinematic in its expression, rhythmic in its telling, The Summer Flood Came Home is both direct and implied – an interconnected vision of presence and past, of a language between languages. Marthakis is a master of her craft, and Flood a dynamic testament of her power.